Learn how to find videos with your voice, "cast" your screen to your TV, share your Chromecast with guests, and more. Chromecast, Google’s $35 TV-on-a-stick (which, incidentally, just got an overhaul), has one noticeable deficit: no remote control. The reason: Your phone (or tablet) is the remote. With the Chromecast app on your Android or iOS device, you’ll be able to set up your new Chromecast, fiddle with its settings, find videos to watch on it, and even “cast” whatever’s on your screen, games included. Controlling your new Chromecast also goes beyond the Chromecast app itself—indeed, there are dozens of Android and iOS apps that’ll work hand-in-hand with Chromecast. All you need to know is which button to tap. Your new Chromecast probably came out of the box with a name like “Chromecast8988,” but you can always call it something else. Indeed, you can rename your Chromecast anything you want, particularly if you plan on having a couple of Chromecasts that you’ll need to tell apart. Nope, your Chromecast doesn’t need to be named “Chromecast8922.” Tap the Settings button to give it a new name. When your Chromecast is idling on your TV, it’ll display an assortment of generic still images onto the screen—pandas, waterfalls, sea shells, you know the drill. You can easily customize what your Chromecast displays when you’re not actively casting videos, with your choices ranging from albums in Google Photos to snapshots in your Flickr account. You can set your idling Chromecast to display photos from your Google Photos account, Facebook, Flickr, and more. Again, open the Chromecast app, tap the Devices tab, tap the Settings button for the Chromecast you want to tweak, then tap Backdrop. On the next screen, you’ll be able to choose from ten options, from snapshots in your Google Photos albums to your Facebook photos, images from your Flickr account, headlines from Play Newsstand, art from the Google’s Cultural Institute and Open Gallery, and even satellite images from NASA. You can also add an overlay in the bottom corner of the screen with your local weather. Bonus tip: To find an interesting image you saw on the Chromecast screensaver, open the Chromecast app, and tap the Devices tab. Tap the little clock icon next to the name of the current image, then tap the left arrow to review the most recent backdrop images. No more click-click-click to search for movies and TV shows using a remote. The Chromecast app will let you search for videos via voice command, and it’ll also search for titles across all your various Chromecast-compatible streaming apps—no more paying to rent a movie on Google Play only to find out it was available through your Netflix subscription. Hankering for a bad horror flick from the 90’s? just tell the Chromecast app. Just open the Chromecast app, tap the microphone icon in the search box, then speak. Remember, you don’t have to restrict yourself to titles; you can also search for actors and directors (“movies starring Clint Eastwood”) or for whatever esoteric category fits your current mood (“horror movies from the 90s”). 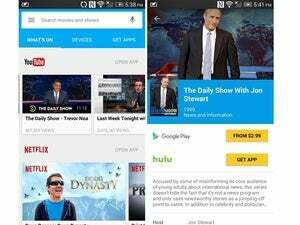 When you tap a video in your search results, you’ll see a list of all the streaming services on which it’s available. Just tap “Watch” to start the show. Editor's note: The original version of this article noted that iOS did not have voice search yet. However, in the short time between writing and posting the story, Apple updated iOS to add that feature. The article now reflects this update. Once you’ve got your Chromecast up and running, you may spot a new button popping up on your various Android and iOS apps—a rectangular button with a little wireless icon in the bottom-left corner. See this button? 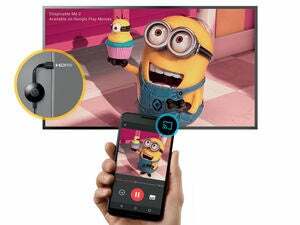 If you find it in an Android or iOS app, that means the app can cast video to your Chromecast. That’s a Chromecast button, and it means that the particular app you’re using—examples range from Netflix and YouTube and Spotify and Pandora—is compatible with Chromecast. Tap the button to start casting with your Chromecast device. Most of the Chromecast-compatible apps you’ll find on Google Play or the Apple App Store are of the video- and music-streaming variety, but Google just unleashed a few dozen games that you can cast, too. Once you cast a game to your TV, your phone or tablet will become a game controller. Get the big-screen Scrabble experience with a little help from your Chromecast. Among the available games: Just Dance Now, Monopoly Dash, Scrabble Blitz, Alien Invaders (a crude Space Invaders rip-off), Simon Swipe (think Simon Says), Wheel of Fortune, and Pongcast. Click here, scroll down and click “Games” for the complete list. Unsurprisingly, Google’s YouTube app has a prominent Chromecast buttons for casting videos to your TV, and you’re perfectly free to cast your Watch Later and custom YouTube playlists. You can create your own Chromecast-powered YouTube TV station by tapping the Add to Queue button. But YouTube has another trick up its sleeves when it comes to Chromecast: a special TV queue that lets you create your own streaming YouTube TV station on the fly. Say you’re already casting a YouTube video to your TV. As you’re watching, you can tap additional videos on the YouTube app and tap “Add to Queue” for each one. When the current clip is over, the next video in your TV queue will start playing automatically. You can also tap Queue to view and manage the TV queue. Even if your favorite app doesn’t have a Chromecast button, you can still cast it onto your TV. The trick: “mirroring” your entire display via Chromecast. The Chromecast app will let you “mirror” your Android display on your TV. Just launch the Chromecast app, tap the menu button in the top-left corner of the screen, then tap Cast screen / audio. Tap the name of the Chromecast you’d like to connect to, and presto: Your phone’s or tablet’s display will appear on your TV, including your interface and home screens. If you’ve got some pals with Android devices hanging out in your living room, they can take charge of your Chromecast with their handsets even if they’re not connected to your Wi-Fi network. Chromecast’s “Guest Mode” is a neat trick, but there’s a catch: Your friends won’t be able to cast any “locally” saved videos or music to your Chromecast, nor will they be able to cast their screens. Instead, they must stick to Chromecast-enabled apps like YouTube, Watch ESPN, and others that stream content directly over the Internet. Chromecast’s “Guest Mode” will let your pals cast videos to your TV, even if their devices aren’t connected to your Wi-Fi network. The first step is enable Guest Mode on the Chromecast itself. Launch the Chromecast app, tap the Devices tab, tap the Settings button for the Chromecast you want to use, then tap Guest Mode. Once you toggle the switch on, your Chromecast should be Guest Mode-ready. Now, ask one of your friends to open a Chromecast-friendly app and tap the Chromecast button. Within a few seconds, their device should detect your Chromecast. Tap the Connect button, then either a) wait for your friend’s handset to connect automatically to the Chromecast (via an ultrasonic audio handshake, a method that never quite worked on my Motorola G) or using a PIN (displayed in the bottom-left corner of the screen).